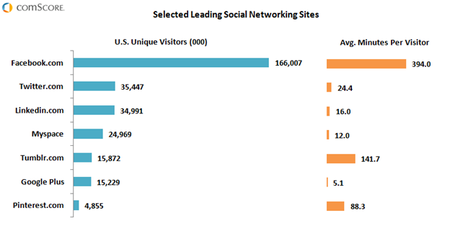 MySpace, the grand daddy of social services is still wheezing along, comScore says in its latest social media report. In fact it is bigger than Tumblr and Google Plus. I have no idea where (and why) MySpace is getting so much traffic – still. Infact, people spend more time on MySpace, a dying platform than on Google Plus says a lot about the latter. Compare the time spent on Google Plus and Facebook and realize that Google is climbing what is essentially the side of a glass building. Also, did you notice Pinterest just cracked the top ten list! As I said, Pinterest is hawt! MySpace is now the defacto platform for music & music makers. It is far from a dying platform, instead it appears to have shifted its place in the the net space. As for Pinterest and Facebook, this seems to show that many people still have a nearly unending amount of time on their hands. Did you notice the dot – that was the time spent on Google +. Essentially that means you go there wonder why you are there and go right back in. This will change very quickly especially how Google is going to deeply integrate G+ profiles with actual SERPs on Google. MySpace is still pretty popular in the music industry which is why they are still around. I wouldn’t call MySpace a “dying platform.” It’s mainly for music artists now, and it seems to work just fine for them. My_ has improved. I think the changes they’ve made may be underrated, but as a site for bands, it is quite good, although Google+ combined with the YouTube (with artist’s Vevo inputs, depending on the label with whom artists are contracted) are beginning to push it out. This study should include YouTube as a part of social networking the more integrated it becomes with Google+. MySpace has music from bands. If you were to take all the band/artist pages out, I think G+ may have more. So – if MySpace is dieing and no other platform bridges the gap for Musicians/band – then time for a new business to grab? Is there an app for that on facebook/Google+? Itâ€™s really not surprising that they get traffic since so many bands use myspace to share their tunes. Hiya, no real surprise, is it? i remember being a member on google+ for three minutes, in fact, spending more time to get the account than actually being part of the network. A whole lot of nonsense. Not that MySpace is any better. facebook is leading for a number of reason, and anyone who ever tried other networks knows exactly why. Although interestingly enough, this story (at the time of posting) only has 8 FB shares and 26 G+ shares…. Its a social network….. If you ever noticed, social = more than 1 or 2 people therefore older networks are going to have more people than newer ones. People have spent lots of time making there myspace pages. Why does everyone expect people to drop those pages the day google+ comes out. For one thye cant be bothered to remake a social page. 2: no one is on google+ they are all still on myspace. Would you walk away from an old playground full of your mates to an empty playground that just has a whole laod of internet marketers hanging about? This isnt interesting. I really think Google + is going to take off in 2012, or maybe Google will push for it to take off! Are u sure, the data is fully valid? Is the data global? Does it capture the trend? MySpace isn’t so much of a social networking outlet as it is a marketing tool for bands and independent music. That’s where the numbers come from. People listening to streaming music from local bands. Absolutely, they paid nothing for it. Myspace will rise again in some incarnation or other. Mark my words. I think focusing on a MySpace / Google+ comparison is really apples and oranges. Although I can’t put anything quantitative behind this, my sense, based on what I’ve observed so far, is that Google+ is going to find its primary niche as a business/professional social networking platform. So it will end up looking more like LinkedIn than Facebook or MySpace. There’s just something about the way Google+ is set up that seems to make it more appealing for business use. And I think Google+ has also made that observation–that’s why they’re making the move of adding Google+ content to their search. If it’s used by professionals networking with other professionals, the content will have more value in search results than would content from social networking activity of a more personal nature. Notice, this chart shows “U.S. Unique Visitors” and would stack up very differently if it were “Global Unique Visitors”… probably would put Google+ WAY above three others due to European traffic. MySpace is definitely the place for posting video and music. My big problem with them was the non-stop spam (and some viruses) I got from them. Have gotten very little of that from Facebook. It’d be interesting to see the progession of traffic. I.E. Has MySpace stayed steady in terms of traffic, or, better yet, have they been gaining back some popularity? What do those numbers look like in comparison with Google+? It’ll be interesting to watch Facebook’s numbers in the coming months with their new introduction of “Timeline” which is essentially a “Myspace Lite”. I know this is anecdotal, but I’ve recently been noticing a severe drop off in my own News Feed. It would be interesting to see if this is across the board. or do not want to have a youtube channel for their band. The simple fact that an edu address was required for Facebook for many years made MySpace the place for people who did not go to college, people in bands, and people who are alternative in some way. While Facebook is not just for privileged white kids anymore there are people who still think of it that way. Military families also account for the high usage especially around the holidays. It may get more visits than tumblr, but look at how much longer people stay on tumblr. It’s really not surprising that they get traffic since so many bands use myspace to share their tunes. Like Craig said, they should embrace that fact and adapt. MySpace is still somewhat popular for musicians/bands. If they could embrace that niche further, IMO, I think they could remain viable for a long time. They better get on it though â€“ Soundcloud, Bandcamp, ReverbNation, etc. are gaining momentum. this was a viable argument maybe 1-2 years ago. today, it’s not even a viable music platform. we now have soundcloud, bandcamp, and facebook musician profiles to fulfill any needs that myspace might have. the major plus of myspace’s music section was that, for whatever reason, people continued to log in to their profile, and they also continued to check out bands through the myspace platform. but without that user base, myspace is utterly useless. i’m actually pretty confused as to how it’s around. anyone care to let me know what the demographics on myspace are like these days? Surprising, not so much the number of accounts there but the amount of time people still spend on MySpace. What’s the time period for this report? My old MySpace page still looks better than any facebook page, even with Timeline. It’s not for social networking though… Twitter and Facebook have that niche. Who is it for then? Anyone who wants to make a great impression with a free, custom-designed page. It’s marketing done right. A great way to learn webpage design too.